Natural foods and cooking expert Kerry Dunnington has just released Tasting the Seasons, a unique and carefully designed, cookbook which focuses specifically on how to identify, select, and prepare foods using ecologically sound principles. Dunnington is a Baltimore food columnist, culinary consultant and caterer who specializes in making eco-friendly and healthy food that is fun to prepare, enjoyable to eat, and entertaining to share. Tasting the Seasons includes an impressive variety of fast and fresh, irresistible, user-friendly recipes, family-oriented one-dish wonders, updated classics, and creative gourmet entrees. Each and every one of the more than 250 superbly seasoned, beautifully presented and eco-friendly meals was selected to serve as the center of any occasion, from an intimate family dinner to a large holiday celebration. Get ready to have your taste buds rewarded with remarkable style and grace. Thoughts from Author: The first memory I have of Brussels sprouts appearing on a dinner plate was when I was in my late teens. My mother introduced them around Thanksgiving time and served them alongside stuffed pork chops and sweet potatoes. Not only was the combination seasonal and colorful, the Brussels sprouts were cooked and seasoned to perfection. Many years later, I thought about how clever my mother was to wait until her brood of five was mature enough to fully appreciate this sophisticated little vegetable. widthwise. 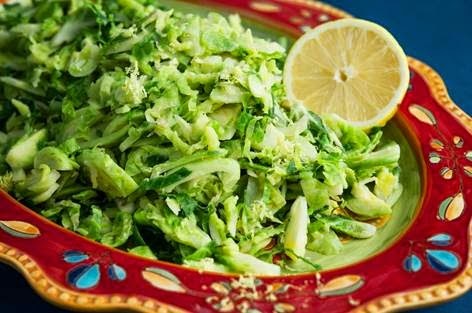 In a large pan, melt butter over moderate heat, add Brussels sprouts and salt and stir to evenly coat shredded sprouts with butter. Cover, reduce heat to medium-low and cook for 1015 minutes, stirring occasionally. Add lemon zest and juice, stir, cover and cook an additional 25 minutes or until tender. Season the Brussels sprouts with pepper. Serve immediately. Disclosure: This recipe and photo is courtesy of the Tasting the Seasons cookbook which is available for purchase now. Please see the author's web site for additional information. Sounds like an Awesome recipe. Definitely going to try it. We enjoy Brussels Sprouts and this is not a recipe I have yet tried. I t sounds delicious and makes me curious about the author's cookbook.